Jess London, a young lawyer, murders his despicable brother-in-law. When London's sister is suspected of the crime, he confesses to the crime. Initially, the confession is not believed but later the police decide to accuse him of the crime. By that time, his sister has been cleared, and London retracts his statement. He decides to act as his own lawyer and plead not guilty. Beyond a Reasonable Doubt was written in 1950, and set in 1940, in a small town in Kentucky. It is a well-written book, with a complex plot which I found very believable, and interesting characters. The last third of the book is taken up with the court room drama. The story is very unusual; we know who the killer is and why it happened. But he is also telling the story in first person narrative. Do we root for him to go free or should justice prevail? Because of this, tension is maintained until the very end. 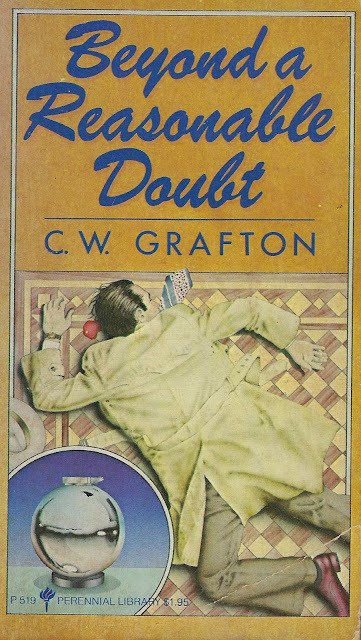 C. W. Grafton was the father of Sue Grafton, and is now best known for his relationship to her. Of his four novels, three were mysteries. This was his last novel, and I believe it is the best known, considered by some a classic. He was a practicing attorney in Louisville, Kentucky, and his three mysteries were set in a fictional county in Kentucky. "My father taught me a lot about writing," Grafton says, "even though he himself eventually abandoned it for his law practice. Still, he often talked about the process of writing, about keeping language simple, about the importance of transitions and paying attention to small details in a scene." Source: Purchased at the Planned Parenthood book sale, 2015. Interesting premise, Tracy. I'm glad it ends with a courtroom drama. The story certainly merits it. It is very interesting, Prashant, and I enjoyed the courtroom portion. There were some unusual approaches since he defended himself. I don't remember where I first learned this, Kay, but I have been looking out for the books for several years. And finally two of them turned up at the annual book sale. The book is different from many written at that time, and I loved the structure of the story. This is really interesting, Tracy, as a premise. I can see how there would be tension throughout the novel. I didn't know, either, that Grafton's father wrote crime fiction. Absolutely fascinating! Based on this book, I wish he had written more books, Margot. I enjoyed it when I read it. I also liked (and love the title of) The Rat Began to Gnaw the Rope (Perennial library 1983 Paperback), which is the only other of his I've read. Good choice. Thanks, Rick. I did get a copy of The Rat Began to Gnaw the Rope at the same sale that I got this book. I am sure I will read that one in the next few months, just to see how it compares. And the second in that short "series" is titled: The Rope Began to Hang the Butcher. Oh I've always wondered about his books - I'd only heard of them via her, she mentioned him and the books occasionally, but I never saw the books anywhere. This sounds good! It was very good, Moira. And different, which I usually like. The moral seesawing's a fascinating concept, Tracy. And learning that Sue Grafton's lawyer dad wrote this is even more so. Gotta read this one! I am sure you would enjoy it, Mathew. Lots of suspense but fun too. Tempted, if I didn't have more than enough already. I do know what you mean, Col. At least this is a vintage book you might enjoy.